Affordable Shade Patio Covers specializes in building decorative concrete patios that offer unsurpassed beauty, functionality, durability, as well as provide refined elegance to your backyard. A decorative concrete patio can provide a seamless blend from the interior to exterior living spaces. Concrete patios can be color coordinated to match a home’s exterior and can be stamped or engraved in patterns such as brick, flagstone, slate or tile. Our goal is to help you choose the right structure for your concrete patio and understand the hundreds of design options available today. We start with the structural choices of basic 4″ or 5″ slab, or a 4″ or 5″ slab with an integrated 12″ perimeter beam. The design choices are numerous. 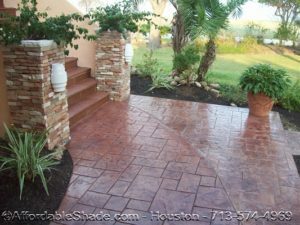 We offer concrete overlays, spray deck, stained concrete and concrete with beautiful stamped patterns. All of our concrete patios, sidewalks, and driveways are built to exceed local building codes, no matter where you’re located. We obtain all required city permits, schedule inspections and assist with your HOA/ARC applications. Contact us to schedule a free design consultation. We’ll take a look at the proposed site, listen to your needs, consider your budget and present you with a timeline and a firm estimate. To prepare for our visit, please have a copy of your survey available and an application or the name of your HOA/ARC. The cost of a concrete patio, sidewalk or driveway is based on many factors, including the slope of your yard, how much existing concrete needs to be removed and the decorative design you choose. 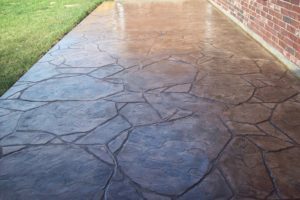 A decorative concrete or stamped concrete patio surface is around 25% to 30% cheaper compared to a brick patio of the same size, and it is over 50% less expensive compared to slate, stone, and marble. It is only around 20% higher compared to a plain concrete patio. For the value, a decorative concrete patio is an outstanding choice for its looks, functionality, and durability. Affordable Shade Patio Covers offers free on-site estimates to all of our customers. By meeting with you at your home, we are able to gather the correct information to price your project and leave you a detailed written estimate or email it to you the following day. The team at Affordable Shade Patio Covers has been building quality patio covers since 2004. 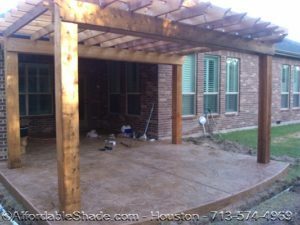 We’ve designed and constructed hundreds of shade arbors, pergolas and patio covers in the Greater Houston area. We have design options to fit any budget – whether you need a small cover to enjoy a morning cup of coffee or an elegant outdoor living space.